Being a gentleman is exhausting, particularly when you do it for someone as young, demanding, and naively ungracious as Alice. Sylvain Chomet, the animator behind The Triplets of Belleville, returns to the screen with a story written by the great French comic Jacques Tati (one of my all-time favorite filmmakers). Tati never filmed a version of The Illusionist, so in a way, this may be the last new Jacques Tati film the world will see. In most of Tati’s films he plays an untalkative, accidental force of nature named Mr. Hulot. But in The Illusionist the title character’s name is Tatcischeff, which is also Tati’s real name. Tatischeff works at theaters performing his tricks, just one man in the evening’s entertainment — call it vaudeville, though The Illusionist is probably set half a century too late for that. He follows the jobs from France, across the channel to London, then to the smaller towns to the north, including a fishing village in Scotland. Always a gentleman, even off-stage, Tatischeff “conjures” a penny or a flower for his acquaintances, including young Alice who cleans his room. When he leaves the village for another new audience — this time to Edinburgh — Alice follows him, not necessarily with his consent. They take a suite at a flophouse for performers — she gets the bed, he gets the couch. Their neighbors are the ventriloquist, the acrobats, and the crying-on-the-inside clown with abhorrent taste in music. With Alice occupying his bedroom, Tatischeff is thrust into the odd position of having to support two people on his salary, which provides the film with its conflict. Chomet’s landscapes are watercolor paintings, simple and evocative. And when Chomet shows us Edinburgh (where I visited last summer), it took my breath way. The characters are less cartoonish than the characters in The Triplets of Belleville. There are exceptions, but basically they are limited by having to exist in the same world as Tatischeff, who bears an uncanny resemblance to Mr. Hulot — the way he looks, the way he moves, the way he bends, the stoical face — Chomet really brings Tati’s Hulot back to life in his animation. Tatischeff is not the young man from Mr. Hulot’s Holiday, but a post- Parade performer who has outlived his renown. The Illusionist is much sadder than the Mr. Hulot films. Hulot was always a bit of a loner — more an observer than a participant. But it wasn’t a sad thing; it was more like Tati’s way of standing in for the audience as he subtly held a mirror to their faces. But the celebrities we love are the forceful personalities, not the subtle audience surrogates. You can imagine Tati taking a little joy in poking fun at preening boy bands. The Illusionist was written in the 1950s, long before Tati’s career had run its course. 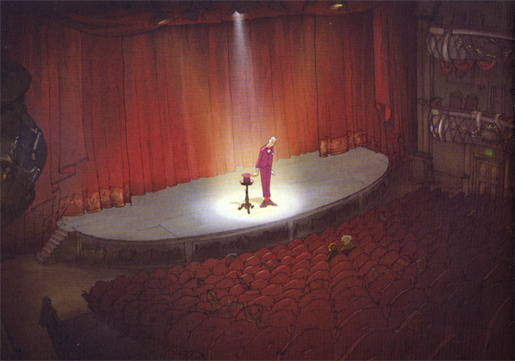 But in the hands of Chomet in 2010, it feels like a plausible personal commentary on the entertainment business. The main character is not “Hulot” but “Tatischeff” (Tati’s real name). Tatischeff is a lifelong performer. His audiences get smaller (until it’s an audience of one) and more demanding (until she’s a financial dependent). There are some blatant scenes of commerce as first the savior of art, and then the destroyer of art. In the end Tatischeff has to walk away, which works out well because his audience was about ready to move on to something else, too. At the end, Tatischeff seems exhausted, but not bitter. If that’s really how Tati felt at the end of his career, then I wish he could have known that 30 years in the future, some of us would see his work, appreciate his genius, and make loving homages; that we still aspire to be gentlemen, although maybe not as strongly as his contemporaries did; and that he was right to be sad because things do change, sometimes for the worse. J Williams: Same name, wrong movie. This was made in 2006.